Summary: 17-year-old Becca spent her whole life protecting her brother from, well, everything. The abandonment of their father, the so called 'experts' who insist that voices in his head are unnatural and must be dealt with, and the constant threat of being taken away to some hospital and studied like an animal. When two representatives appear claiming to have the answers to Ryland's perceived problem, Becca doesn't buy it for one second. That is until they seem to know things about Ryland and about Becca and Ryland's family, that forces Becca to concede that there may be more to these people than meets the eye. Though still highly skeptical, Becca agrees to do what's best for Ryland. Review: Doesn't that green gem just look gorgeous? I find it fitting, since The Holders is set in Ireland, one of my top places to visit! 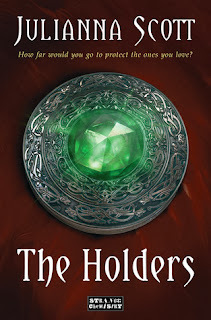 The Holders revolves around Becca, a seventeen year old who has spent most of her life protecting her little brother, Ry. Ry has always been different from the other kids, and Becca is fiercely protective of him, so it only makes sense that she's highly suspicious when two men show up out of nowhere saying that they can help. In the end she decides that Ry can go with them - but only if she can go as well. From there we're taken off to Ireland, truly a part of the book I really enjoyed. Ireland has always fascinated me, and the bits and pieces we glimpse throughout the book are compelling and interesting. Mixed into this is burgeoning romance and best of all - secret powers! The abilities that come up in the book was something else I really enjoyed. I've always loved it when authors show us abilities that are rooted in 'our' world, and this book has plenty of those, from people who can read minds, cast illusions, move things and more. The way this is presented, from history to how it's passed down, to how they control it, is obviously well thought out and fascinating for someone like me who loves getting down to the intricacies of how things work and compelling worldbuilding. The weak part of the book comes from a bit of predictability - I was able to guess at the major reveal in the book and also the major relationship that developed. The romance especially was a weak spot, for me - it felt as though it developed a bit quickly, for my tastes, and... Okay, I'll admit it, the age difference bothers me, though I'm not a prude. The connection between the two romantic leads is a bit tenuous, in my opinion - I've read concepts like this before, and it is very difficult to pull off. This book has more thought put into it than most, but I still found it a bit lacking. 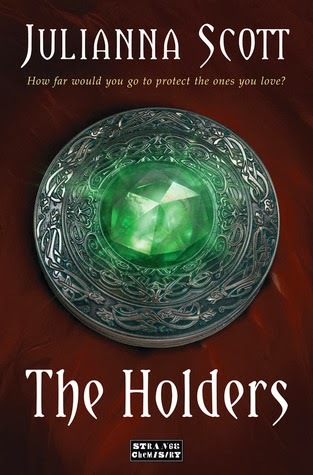 Overall, though, The Holders is a great debut novel and I would definitely pick up the second book in the series! Disclosure: An ARC was provided through Netgalley for review.